Ht / Wt: 5'11" / 198 lb. 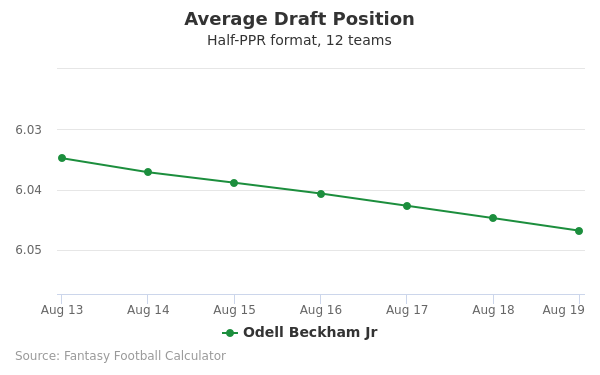 Odell Beckham Jr's fantasy value is measured by his average draft position (ADP) in fantasy football mock drafts. 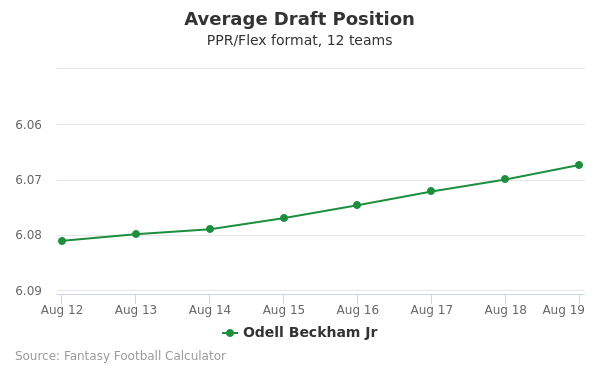 In recent drafts, Beckham Jr's current ADP is 2.02, which indicates that his fantasy outlook is to be the 2nd pick of the 2nd round, and 13th selection overall. 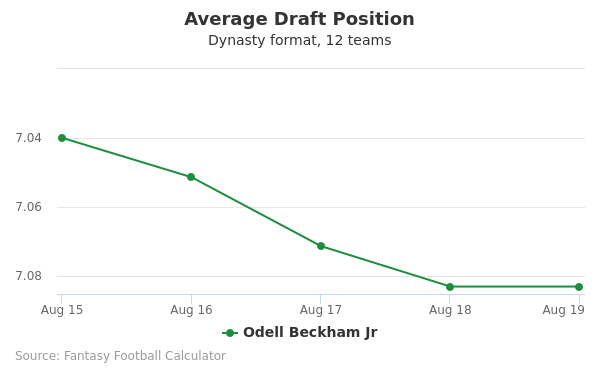 The code below will display a graph that updates every day to show the ADP data for Odell Beckham Jr for the past 30 days in 12-team PPR leagues. Draft Odell Beckham Jr or Tyreek Hill? Draft Dalvin Cook or Odell Beckham Jr? Draft Odell Beckham Jr or Travis Kelce? Draft JuJu Smith-Schuster or Odell Beckham Jr? Draft Antonio Brown or Odell Beckham Jr? Draft Nick Chubb or Odell Beckham Jr? Draft Odell Beckham Jr or Pat Mahomes? Draft Mike Evans or Odell Beckham Jr? Draft Marlon Mack or Odell Beckham Jr? Draft Odell Beckham Jr or Zach Ertz? Draft Damien Williams or Odell Beckham Jr? Draft Odell Beckham Jr or T.Y. Hilton? Draft Leonard Fournette or Odell Beckham Jr? Draft Adam Thielen or Odell Beckham Jr? Draft Odell Beckham Jr or Sony Michel? Draft A.J. Green or Odell Beckham Jr? Draft Keenan Allen or Odell Beckham Jr? Draft George Kittle or Odell Beckham Jr? Draft Mark Ingram or Odell Beckham Jr? Draft Aaron Jones or Odell Beckham Jr? Draft Amari Cooper or Odell Beckham Jr? Draft Odell Beckham Jr or Phillip Lindsay? Draft Derrick Henry or Odell Beckham Jr? Draft Odell Beckham Jr or Stefon Diggs? Draft Aaron Rodgers or Odell Beckham Jr? Start Antonio Brown or Odell Beckham Jr? Start Odell Beckham Jr or Pat Mahomes? Start Mike Evans or Odell Beckham Jr? Start Marlon Mack or Odell Beckham Jr? Start Odell Beckham Jr or Zach Ertz? Start Damien Williams or Odell Beckham Jr? Start Odell Beckham Jr or T.Y. Hilton? Start Leonard Fournette or Odell Beckham Jr? Start Adam Thielen or Odell Beckham Jr? Start Odell Beckham Jr or Sony Michel? Start A.J. Green or Odell Beckham Jr? Start Keenan Allen or Odell Beckham Jr? Start George Kittle or Odell Beckham Jr? Start Mark Ingram or Odell Beckham Jr? Start Aaron Jones or Odell Beckham Jr? Start Amari Cooper or Odell Beckham Jr? Start Odell Beckham Jr or Phillip Lindsay? Start Derrick Henry or Odell Beckham Jr? Start Odell Beckham Jr or Stefon Diggs? Start Aaron Rodgers or Odell Beckham Jr? Odell Beckham Jr. is an NFL wide receiver for the New York Giants and is widely considered one of the league's best receivers. In November 2016, he became the fastest player to 3,500 career yards in just 36 games at the age of 24. A native of Baton Rouge, Louisiana, Beckham attended Isidore Newman High School in New Orleans—the same high school of NFL quarterback greats Peyton and Eli Manning. Through his senior year, Beckham lettered in basketball and track, as well as football. He played multiple positions on both sides of the ball on the gridiron. Beckham's father was a football player and his mother ran track, and at age 4, he proclaimed he would one day be an NFL player. Beckham signed to play at Louisiana State University as a high school senior in 2011. He played in 40 games over three years for the Tigers, amassing 2,340 receiving yards and 12 receiving touchdowns and was also an effective kick and punt returner. He was part of a BCS runner-up, 13-win team as a freshman and 10-win teams as both a sophomore and junior under head coach Les Miles. As a freshman, Beckham caught 41 passes for 475 yards and two touchdowns. In the BCS National Championship against Alabama, which the Tigers lost 21-0, Beckham was LSU's leading receiver. He had five receptions for 38 yards. In his sophomore season, Beckham increased his production to 43 receptions for 713 yards, again with two touchdowns. He had at least two receptions in each games in 2012 and the Tigers lost by a point in the Chick-fil-A Bowl to Clemson. Beckham had 59 receptions for 1,152 yards and eight touchdowns as a senior in 2013. He had five games with more than 100 receiving yards and three games with multiple touchdowns. He caught a pair of passes for 35 yards in a 21-14 win against Iowa in the Outback Bowl. The year resulted in Beckham being named to the All-SEC First Team and receiving the Paul Hornung award, given to college football's most versatile player. The New York Giants selected Beckham with the 12th pick in the 2014 NFL Draft. In the NFL combine, he recorded a 4.43 second 40 time and had a vertical of 38.5 inches. The small amount of skepticism there was concerning Bekcham's NFL potential revolved around his height (5-foot-11) and strength. He signed a base contract of $420,000 with a $1.47 million signing bonus. His current salary is for $10.4 million over four years. 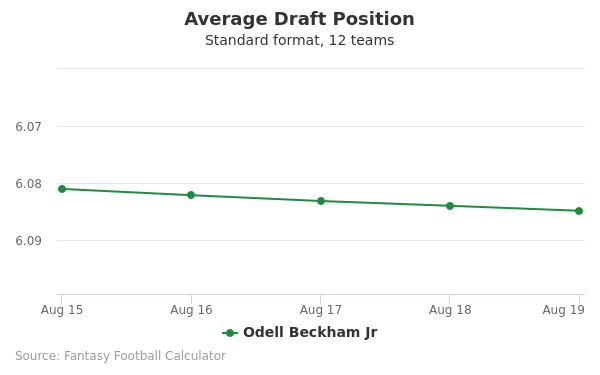 Up to this point, Beckham has been, by many metrics, the most impactful NFL player from the 2014 draft. In his second NFL season, Beckham was just impressive as he was as the NFL's rookie of the year in 2014. In 15 games, he had 96 receptions (ninth in the NFL), 1,450 receiving yards (fifth) and 13 touchdowns (t-fourth). He had eight games with at least 100 receiving yards and had a season-high 166 yards on Dec. 14 against Miami. The six-win Giants and quarterback Eli Manning were as reliant on Beckham as any team and quarterback were of its star receiver, as he led the team in receiving yards in 10 of 16 games. Beckham earned a spot in the 2016 Pro Bowl. With two excellent seasons under his belt, Beckham had inserted himself in the conversation of best receiver in the NFL. His numbers, however, were expected to be tempered in 2016 by New York's selection of reciever Sterling Shepard in the 2016 NFL Draft and the return to health of receiver Victor Cruz. Despite those additions, Beckham still proved he could take over games, with five 100-yard games (including one 222-yard game) and a total of 1,367 receiving yards and 10 touchdowns. His 11-win Giants gave him his first playoff appearance, where he had four receptions for 28 yards in a loss at Green Bay. Once again, Beckham was selected to the Pro Bowl. Rumors have circulated about Beckham's relationships with celebrities Khloe Kardashian and Demi Lovato. One of his best friends is David Alaba of professional soccer's Bayern Munich. Beckham is known for being extremely emotional on the field and involved in buzz-worthy social circles off of it. His Twitter handle is @OBJ_3 and he tweets often to and about other NFL players.